Exodontia is the branch of dentistry dealing with extraction of teeth from the socket in the bone. Jeffrey and Howe described ideal tooth extraction as “painless removal of whole tooth or tooth root with minimal trauma to investing tissue“. Extraction of a tooth is determined or assessed in the diagnosis step, Extraction of teeth is done in two cases – when the tooth is infected or damages due to caries or fracture of tooth or Periodontally weak and becomes mobile, the other instance is in cases like Orthodontic cases or situations where the tooth is in the line of a fracture and needs to be extracted. Morphology of the roots (with an X-ray), fused, ankylosed, dilacerated, hypercementosed, divergent roots. Maxillary or the upper teeth when requiring extraction the following forces are exerted, the forces exerted are different for each tooth but the first pressure applied on maxillary tooth while Extraction is Apical Force. The beak of the forceps should engage the neck or the tooth or below the cervical region of the tooth. If not the crown can break on applying forces of extraction. Forces to Extract Central Incisors: Apply Apical force first to engage the forceps in the neck of the tooth continue with labial pressure and then lingual pressure followed by a mesial rotation. Lastly, give a pulling motion or occlusal force to extract the tooth. Forces to Extract Lateral Incisors: Apply Apical force first to engage the forceps in the neck of the tooth followed by Labial pressure then lingual pressure and again labial pressure (a to and fro motion to tear the PDL). Lastly give a mesial rotation and pull the tooth out of the socket. Forces to Extract Cuspids / Canines: Apply Apical force first to engage the forceps in the neck of the tooth followed by Labial pressure -> Lingual Pressure and Labial pressure again, lastly give a mesial rotation and a pulling motion to pull out the tooth of the socket. Forces to Extract First Cuspids or Premolars: Apply Apical force first to engage the forceps in the neck of the tooth and apply Buccal pressure followed by Lingual pressure and give a pulling motion while applying Buccal force to pull out the tooth. Forces to Extract Second Cuspids or Premolars: Apply Apical force first to engage the forceps in the neck of the tooth and apply Buccal pressure followed by Lingual pressure and give a pulling motion while applying Buccal or Lingual force to pull out the tooth. Forces to Extract Molars: Apply Apical force first to engage the forceps in the neck of the tooth and then give Buccal pressure and followed by slight palatal pressure (not heavy as it might break the palatal bone plate). Lastly, give a distal rotation and once luxated you can give a Figure of eight motion and pull the tooth occlusaly to extract the tooth. 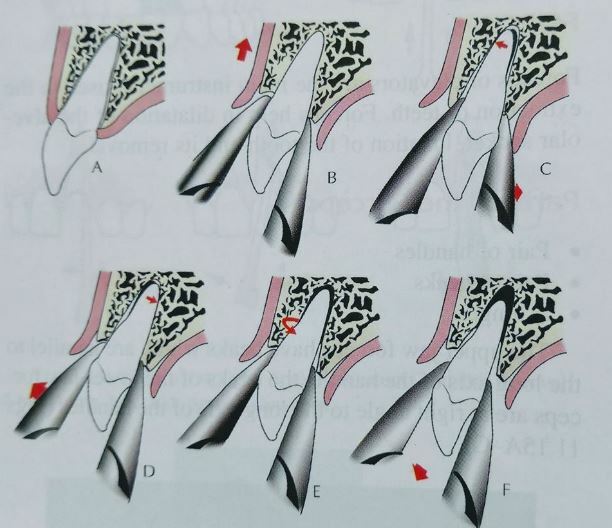 Forces to Extract Central Incisors: Apply Apical force first to engage the forceps in the neck of the tooth continue with labial pressure and then lingual pressure followed by a slight mesial to a distal rotation. Lastly, give a pulling motion towards labial direction to extract the tooth. Forces to Extract Lateral Incisors: Apply Apical force first to engage the forceps in the neck of the tooth followed by Labial pressure then lingual pressure followed by a slight mesial to a distal rotation. Lastly pull the tooth out in the labial direction from the socket. Forces to Extract Cuspids / Canines: Apply Apical force first to engage the forceps in the neck of the tooth followed by Buccal pressure, lastly give a mesio distal rotation and a pulling motion to pull out the tooth of the socket. Forces to Extract First Cuspids or Premolars: Apply Apical force first to engage the forceps in the neck of the tooth and apply Buccal pressure followed by slight mesiodistal and pull out the tooth. Forces to Extract Second Cuspids or Premolars: Apply Apical force first to engage the forceps in the neck of the tooth and apply Buccal pressure followed by slight mesiodistal and pull out the tooth. Forces to Extract Molars: Apply Apical force first to engage the forceps in the neck of the tooth and then give Buccal pressure and followed by slight lingual pressure. Lastly, pull the tooth towards the buccal or lingual direction to extract the tooth. There are two types of Extractions – Intra-alveolar or Closed type which does not involve any tissue cutting or damage to surrounding tissues, the tooth is extracted in a simple manner with forceps. The other type is trans alveolar or Open type where there is less use of forceps and a mucoperiosteal flap elevation is done to extract the tooth surgically. Extremely useful information. Thank you.